Installation marks the first time Arizona’s premier audio-visual firm has used the organic light-emitting diode (OLED) display in a commercial setting. Stacked on top of each other, the OLED display is an impressive 96” tall column of glass. 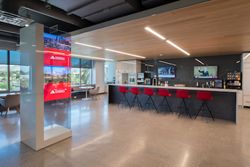 When commercial real estate leader Cushman & Wakefield wanted to make a huge impact in their Phoenix office, they reached out to Immedia Integrated Technologies. The result was a branded lobby that uses cutting-edge technology to differentiate the real estate company and warmly welcome guests. Immedia was hired to implement comprehensive audio-visual upgrades across Cushman & Wakefield’s state-of-the-art office. Across the five conference rooms and video-conferencing suite, Immedia used Cushman & Wakefield’s corporate standard of Mersive Solstice, a wireless video-sharing device. But when it came to the lobby, they wanted something more than standard. Immedia collaborated with Cushman & Wakefield’s interiors team, RSP Architects, to design its first organic light-emitting diode (OLED) display. They reached out to NoleWork to build the custom housing for the double-stacked display of transparent televisions. Stacked on top of each other, the OLED display is an impressive 96” tall column of glass. Installed in front of a window, it makes for a striking visual that allows guests to see the branded Cushman & Wakefield content while also being able to look out the window. Across the rest of the facility, Immedia used Crestron’s Basic Presentation Controller, a simple, wall-mounted controller. This enables employees to use all of the rooms in the same way, which streamlines functionality and maintains a consistent feel.